Many web developers are challenged to design user interfaces that provide an interactive experience while collecting data from users and dynamically creating new page elements. 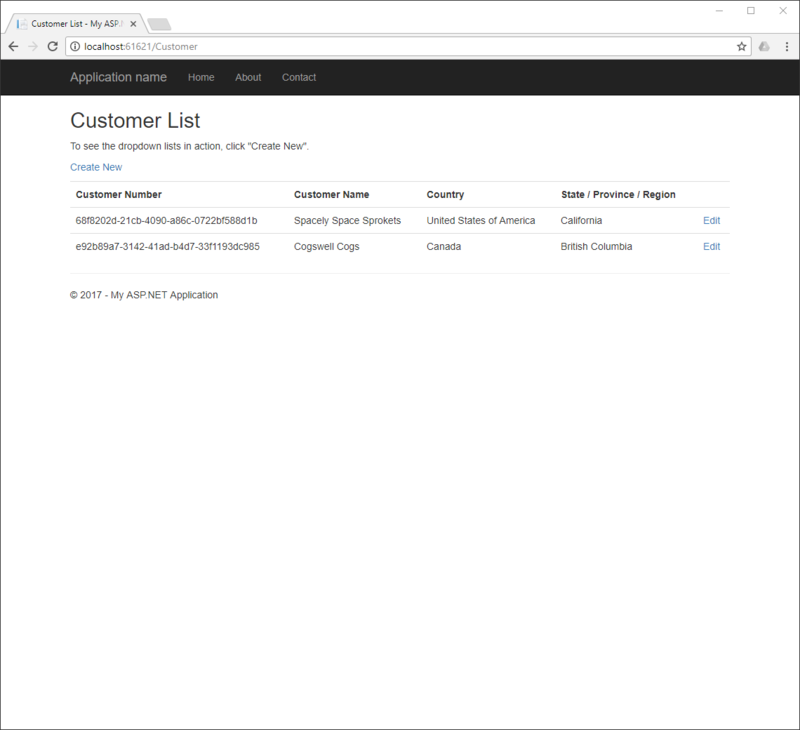 Microsoft provides support for Ajax functionality in ASP.NET MVC through classes in the System.Web.Mvc and System.Web.Mvc.Ajax namespaces. One of the principal classes in this group is AjaxHelper<TModel> which, as Microsoft puts it, "includes methods that provide client-side functionality in ASP.NET AJAX in MVC applications, such as creating asynchronous forms and rendering links. The AjaxHelper class supports asynchronous partial-page updates." The case study presented in this guide uses one AjaxHelper class method, BeginForm to provide the asynchronous functionality needed to update a section of a web page without refreshing the entire page. The rest of the functionality comes from basic ASP.NET MVC components like controller actions and partial views. The examples shown in this guide are derived from a case study project available on GitHub. You can download and run the project to see the techniques illustrated here in action and to experiment on your own. The case study application, BlipAjax is a simple system for gathering, storing, and retrieving geographic and other information about customers. It's not production-ready from either the design or coding perspectives; it exists to illustrate the concepts discussed in this guide. More importantly, Entity Framework and the repository and MVVM design patterns are production-ready tools. The example project was constructed so you can start with the MVC template and put together your own solutions using these resources using the sample project as a guide. The Seed method of the Configuration class in Blip.Data.Migrations contains data for populating the lists of Countries and Regions. Selecting Edit at the end for a customer opens the customer edit page. It's this page that implements the Ajax functionality described in this guide. The Address Type dropdown enables the user to select either "Email" or "Postal" address. When the user presses "Select", the Ajax HTTP POST functionality of the related partial view, AddressTypePartial.cshtml, is activated and the page is updated with either the partial view for creating an e-mail address, CreateEmailAddressPartial.cshtml, or CreatePostalAddressPartial.cshtml, the partial view for creating a postal address. ASP.NET MVC Ajax Helper classes provide functionality similar to that of a client-side framework without imposing the development overhead. With relatively little C#, a developer can create flexible, responsive user interface elements. Separation of concerns and the constraint that HTML pages cannot have nested views both dictate that the Customer/Edit view cannot have its own view model. Instead, each form section of the view is composed of a partial view with its own view model. Although there are a number files that comprise the single page Customer/Edit page, the relationship of the files is easy to discern. Note that in the example application only one of the address partial views appears on the page at one time, either the e-mail partial view or the postal address partial view. Note also that CreateEmailAddressPartial and CreatePostalAddressPartial only have signatures for HTTP POST because the POST action of AddressTypePartial performs the function of invoking the Razor engine for the e-mail address and postal address partial views. There is no @model Razor directive: as noted in the code, the view models exist in the partial views. The @Html.Action HtmlHelper is used to render two partial views when the Edit view is first rendered. The HtmlHelper invokes the corresponding HTTP GET action in CustomerController.cs. The HTTP GET controller methods associated with the partial views require the current value of CustomerID to retrieve and return the appropriate data. This value is also the route value for the view, but it could also be passed in the ViewBag collection when the Edit view is called from the Index view. Judicious use of route values and data passed in the ViewBag or ViewData collections can serve the same function as data that might otherwise be bound in the data model. An empty HTML element is used as the target for the Ajax action that renders either the e-mail address or postal address partial view. Including the reference to ~/bundles/jqueryunobtrusive in the scripts section of the Edit.cshtml page ensures the Ajax library gets loaded after the jQuery library and only gets loaded on the page where it is used. Form controls bound to the view model. A submit button for the form. Note that it also has a code section where the value of the Layout attribute of the view is set to null. This addresses a problem where in which the Razor rendering engine can apply all the features of the _Layout.cshtml file, usually found in the Shared folder, to partial views when the first partial view encountered has a bound data model but the parent view does not. Setting this value to null forces the Razor engine to render the partial view as a partial view. Because the submit button is associated with the HTML form defined in this partial view, its action and the data associated with it are specific to this <form> element within the page. The partial view for selecting the address type to add (e-mail or postal) is also simple and is, for the most part, similar to a conventional data-backed view. The important differences are in how the <form> element is generated and, as a result, what happens with the submit button is pressed. The HTML <form> element is generated with the Ajax.BeginForm helper method rather than an Html.BeginForm helper method. The first argument, "AddressTypePartial", identifies the partial view that contains the form. UpdateTargetId CreateAddress The element of the parent form (Edit.cshtml) to be acted on by the result of the POST action. InsertionMode InsertionMode.Replace What will be done with the results of the POST action in relation to the target element. Note that an Html.AntiForgeryToken() method call is included for each partial view. The generated HTML rendered by the browser for the Customer/Edit view appears below. It is worth studying the client-side HTML closely because doing so makes the relationship between the partial views, the <form> elements, and the controller actions clearer. Each form has an anti-forgery token. Each form has a HTTP POST action that points to the controller method signature corresponding to the POST method for the associated partial view. The SelectAddressTypePartial form element includes Ajax attributes that specify the actions to perform when the POST action returns from the server, including specifying the replacement of the CreateAddress element. The <div id="CreateAddress"></div> element exists within the <body> element, but outside either of the <form> elements. The <script> includes at the bottom of the page include jquery-3.2.1.js and jquery.unobtrusive-ajax.js, the two libraries essential for the AjaxHelper classes. Ellipsis (...) indicates code has been redacted for brevity. This adds a third <form> element to the page with its own submit button. Selecting "Postal" in the Address Type dropdown and pressing Select adds the corresponding partial view for adding a postal address. 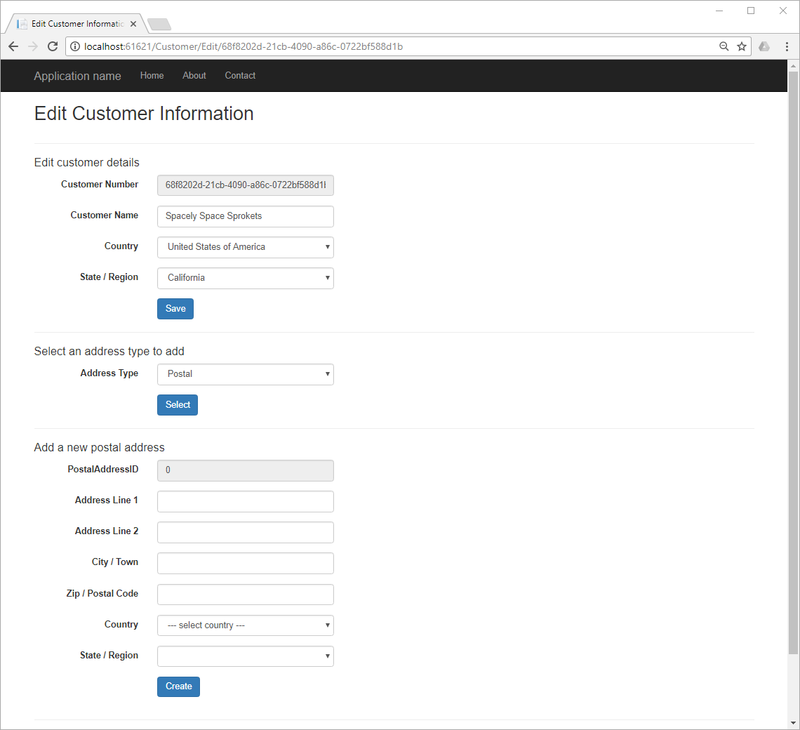 Each form interacts with its own controller methods, as do the forms for editing customer information and selecting the type of address to add (e-mail or postal). Accordingly, updated information about the customer can be added using the first form on the page independent of the submission of the e-mail address or postal address information. Looking at the CustomerController.cs methods will provide a more complete understanding of how each section of of the Customer/Edit view works and how Ajax is used to update the view with new content without refreshing the entire page. Note that there is no POST method for the Edit parent view because all the forms and submit buttons belong to partial views and each has its own associated controller methods. Note also that there are no HTTP GET actions for the e-mail address and postal address partial views. These views are rendered by the POST action signature of the AddresTypePartial method. Rendering the view begins with an ActionResult method for Edit.cshtml, the parent page. Note that there is no view model associated with this view; as described above, all the related view models are associated with the partial views. All that this view needs to to is check for a valid GUID and return the view. Note that the Html.Action helper method passes the route value for the CustomerID as an argument. The value of id is used to retrieve the customer record from the SQL Server database using the GetCustomer method of CustomersRepository. The customer information is returned in an instance of CustomerEditViewModel, which provides the values for the dropdown lists for Country and Region as well as the current values for the country and region associated with the customer record. This is all handled by the repository so the business logic doesn't have to be concerned with the data needed for mechanizing the user interface. The method is decorated with the ChildActionOnly attribute to indicate that it can only be called within a parent view, never as a standalone GET action. This prevents the partial view from being rendered on its own and potentially being used to subvert the proper operation of the application. As with the partial view for editing customer information, this GET method populates the data in the view model that supports the user interface. At this point, the Razor engine has all the data and markup it needs to render the page. 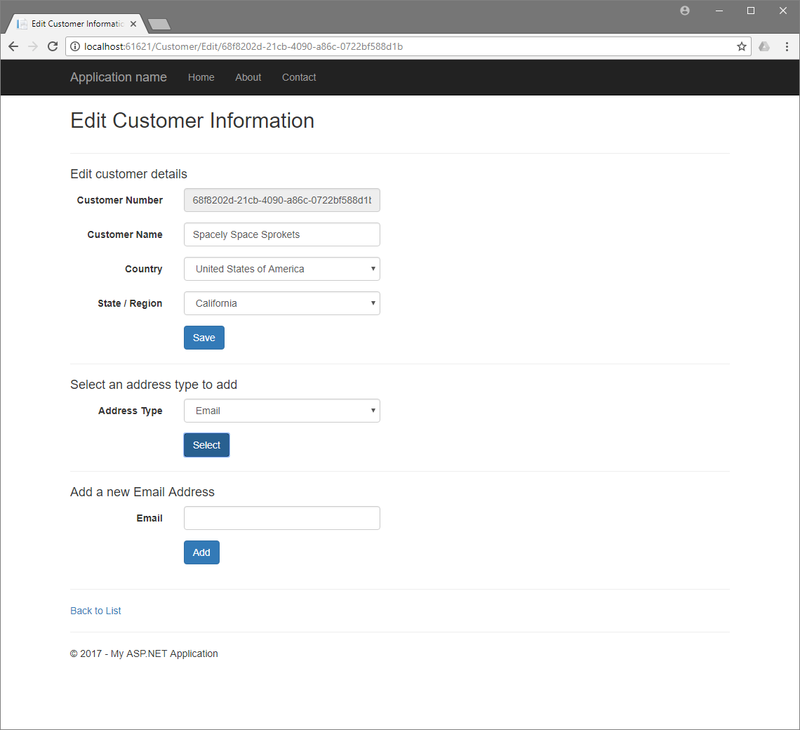 The Customer/Edit view can be used by the user. When the user selects an address type to add and presses the Select button, the data is sent to the server and handled by the POST method for AddressTypePartial. This method will not execute unless the anti-forgery token associated with the form is valid. 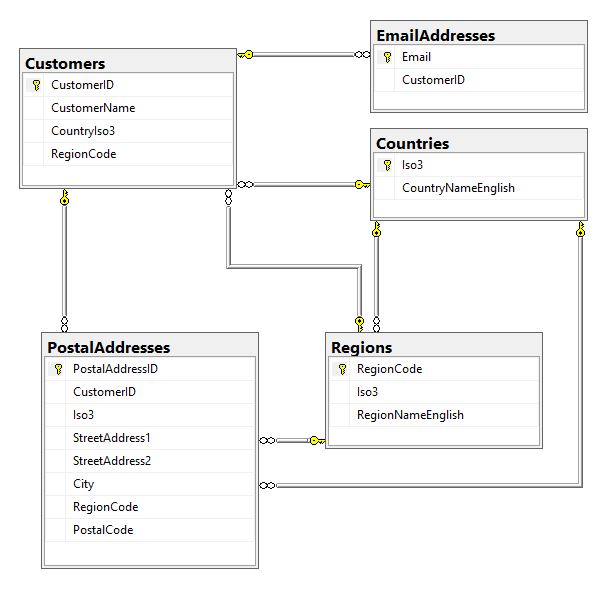 Depending on the type of address selected by the user, this method creates an instance of the appropriate view model and sets the value of CustomerID. If the postal address type is selected, the controller also populates the relevant SelectList collections for the lists of countries and regions. Then the controller then returns the appropriate view along with the associated view model. At this point the user can enter and submit data for the selected address type, or re-select the address type and see the page updated with the other partial view. Once the user enters data and presses the Save button, the appropriate POST controller method handles the request. In the case of an e-mail address, the POST method looks like this. It is a simple matter of using the repository to save the data and responding accordingly to the results of that method call. In the example project, when the e-mail address is successfully saved, the controller passes control to the method to load the Customer/Edit page (Edit.cshtml) for the current customer. This is equivalent to resetting the page. In real-world applications, any number of other results are possible, including reloading an Ajax partial view that displays the current list of addresses of the associated type. In addition to adding a new form to a page, the Ajax.BeginForm helper can be used to create Ajax functionality to perform other useful actions. The actionName, controllerName, and routeValues parameters can be used to access controller actions from a specific controller and pass a variety of data to the controller. InsertionMode — defines whether the new <form> element replaces the identified element or is added before or after the existing element. This is useful when building a list of items on the page as the user adds information. ASP.NET MVC AjaxHelper methods provide a flexible way to add Ajax functionality to Razor views. In many cases this can provide the desired functionality without the resource commitment and potential learning curve associated with implementing a client-side framework like Angular. Implementing the Model View ViewModel (MVVM) design pattern by combining Ajax helpers with partial views and associated view models can provide an effective separation of concerns for interactive pages built with these resources. Compatibility of ASP.NET security tools like the anti=forgery token with Ajax helpers ensures the robust security of ASP.NET without additional programming effort. Developers should evaluate the capabilities of AjaxHelper methods before deciding to move from ASP.NET MVC to WebAPI and Angular (or another client-side framework). This is particularly true when search engine optimization (SEO) and page analytics integration are objectives. ASP.NET MVC Advanced Topics by Scott Allen, 22 July 2009. The first module of this course, Ajax with ASP.NET MVC, provides a nice narrated overview of the related technology. 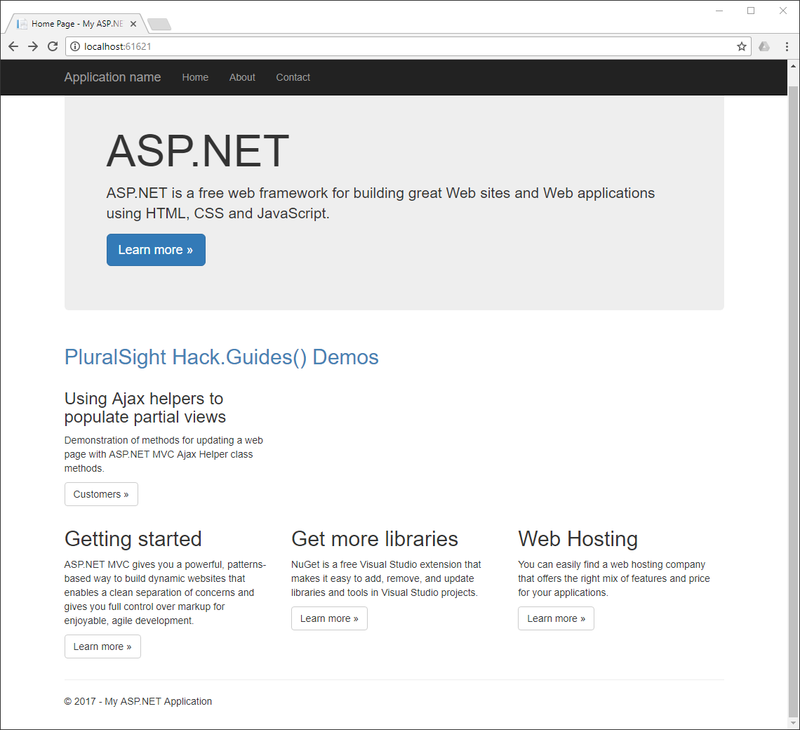 Disclaimer: PluralSight and the author of this guide are not responsible for the content, accuracy, or availability of 3rd party resources. Microsoft: System.Web.Mvc.Ajax namespace — This is the canonical documentation for the AjaxExtensions (including the BeginForm method) and AjaxOptions classes. Note that if you go looking for information on docs.microsoft.com it will boot you over to this URL. Although this page refers to Visual Studio 2013, it is, in fact, the most recent documentation. Thanks for reading! If you found this article informative or engaging please favorite this article and drop a comment below!